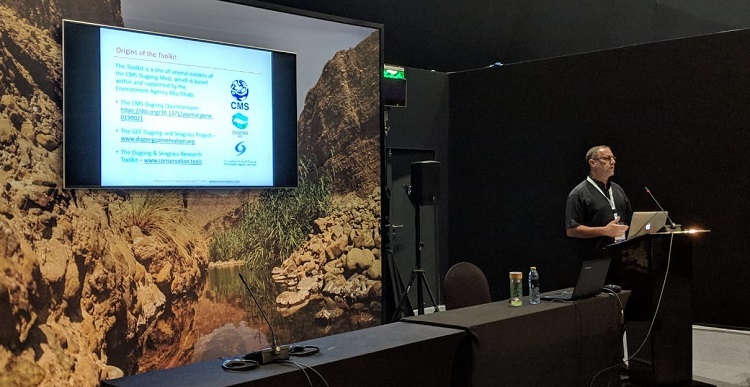 Dubai, 25 October 2018 - During the 13th Meeting of the Conference of Parties (COP13) to the Convention on Wetlands (Ramsar) held in Dubai, the Dugong and Seagrass Research Toolkit was demonstrated and discussed in a side-event organized by the Dugong MOU Secretariat and Environment Agency – Abu Dhabi (EAD). With the theme, ‘Wetlands for a Sustainable Urban Future’, COP13 provided the perfect forum to learn about the most appropriate tools and techniques to use in researching dugong and seagrass conservation. A team of Technical Advisors from the CMS Dugong MOU’s Dugong Technical Group developed the Toolkit. One of the Technical Advisors, Dr Nicolas Pilcher from the Marine Research Foundation, led the toolkit demonstration at the event after introductions provided by Dr Donna Kwan from the Dugong MOU Secretariat and Dr Himansu Sekhar Das from EAD. Attended by over 50 delegates, the gathering was an opportunity for participants to learn about successful research techniques and approaches, and to gain insight into the various challenges that countries still face in research regarding dugong and seagrass conservation. Dr Pilcher also mentioned how the toolkit could be adapted to research regarding conservation of mangroves, coral reefs, and other species such as manatees. Seagrasses are often present in coastal Ramsar sites and collecting standardised and comparable data is an important first step in their conservation. The Toolkit, a collaboration between Environment Agency – Abu Dhabi, TOTAL, Total Abu Al Bukhoosh, and the CMS Dugong MOU Secretariat, is a decision-support tool for research into dugongs, seagrasses and the associated human communities. 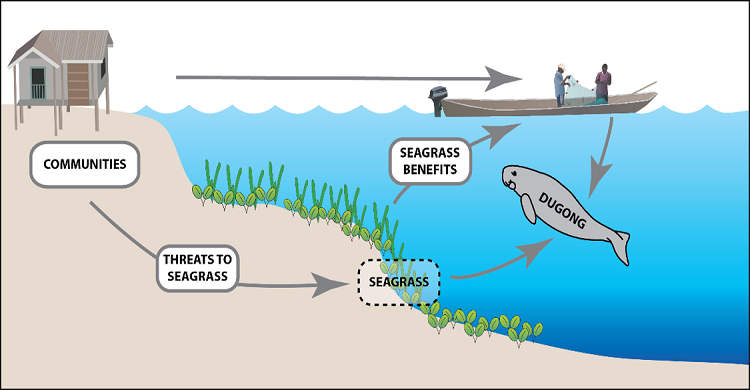 The Toolkit has been designed to help standardise data sets and methods across different countries and sites, allowing for better comparison of global dugong and seagrass conservation status, and ensure that researchers consider the link of dugongs, seagrasses and human communities. The user-friendly toolkit has the potential to make a significant contribution to dugong and seagrass conservation across the dugongs’ range. The event helped emphasize the need to conserve seagrass, which are critical ecosystems, and protect the vulnerable dugongs, that solely rely on seagrass.